Elizabeth Pearson, Erin Eva Butcher, and Michael Underhill get their panto on. Hub Review readers know by now I'm a big fan of the Imaginary Beast's winter pantos - but I confess it's getting hard to "review" them, because Beastmaster Matthew Woods hews so ardently to the template of this tradition that basically it's the same show every year. So the 2015 edition, Kerplop! 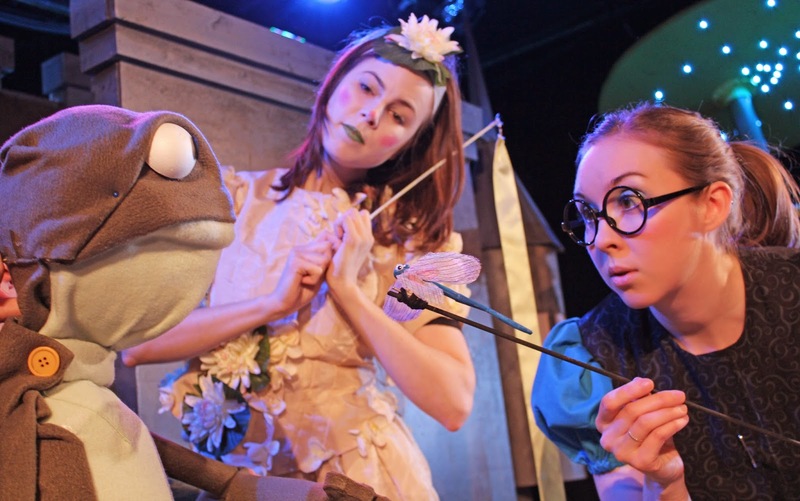 The Tale of the Frog Prince (through tonight only, at the BCA) proved as charming as usual, and seemed to enthrall the kids in attendance just as expected. In case you don't know, the "panto" is an eccentrically British mix of fairy tale and burlesque, in which cross-dressing is the norm, audience participation is key, a few fresh pop tunes get a re-boot, and whimsical fancy sells moral maxims to the 5-to-8-year-old set (even as winking double entendres sail over their heads). I could spend more time analyzing its curious appeal (and why it resonates in the millennium) - but really, it's just a hoot, for both actors and audience, so why bother? Like most of the Beasts' pantos, Kerplop! runs a little long - but the kids never seem to mind, and something about the format's devotion to nonsense at all costs does help banish (or at least lift) the winter blues. So even if you don't have kids in tow, you may find a panto is just the thing for what ails you this February. Molly Kimmerling and Amy Meyer inspect Jeremiah the bullfrog. Photos: Michael Underhill and Cameron Cronin. For the record, Kerplop! has a bit more political cogency than usual, what with its amphibious hero battling the environmental poisons of the evil "Aquanetta" (and "Go Green!" joining the audience rallying cry of "Boo-hiss-boo!"). I likewise sensed an extra dash of imagination in the set (by Candido Soares and Woods himself, who as Aquanetta chewed the scenery he'd helped design) - and I should mention, I think, that the show's graphics (by Elizabeth Pearson and Jill Rogati) were the best yet for this troupe (and that's saying something, as brilliant imagery is a Beast hallmark). Of course Cotton Talbot-Minkin's costumes, it goes with saying, were awesome as ever, and integral to the whole show's success (this year's highlight was the Queen of Little Puddle's Alice-in-Wonderland get-up). And another shout-out must go to the choreography, by Kiki Samko, Cameron Cronin, and Joey Pelletier, which included a hilarious underwater ballet that nailed the famous "Dance of the Cygnets" from Swan Lake. Elsewhere the Beast held to their usual high standards; after all, by now they have been doing pantos for years, and their expertise is a given. So it was good to see stalwarts William Schuller, Amy Meyer, Molly Kimmerling, Noah Simes, Mike DiLoreto, Cameron Cronin, Michael Underhill and Elizabeth Pearson once more strut their panto stuff in a variety of roles. Of course Joey Pelletier (as ever) stole the show as Her Majesty, the Queen - but he got stiff competition from relative newcomers Erin Eva Butcher, who shone in the part of Princess Aurelia, and Michael Chodos, who threw himself with appealing abandon into the machinations of the slimy Leech. If you can't catch this merry band today, however, don't feel too bad - they'll no doubt be back next year. 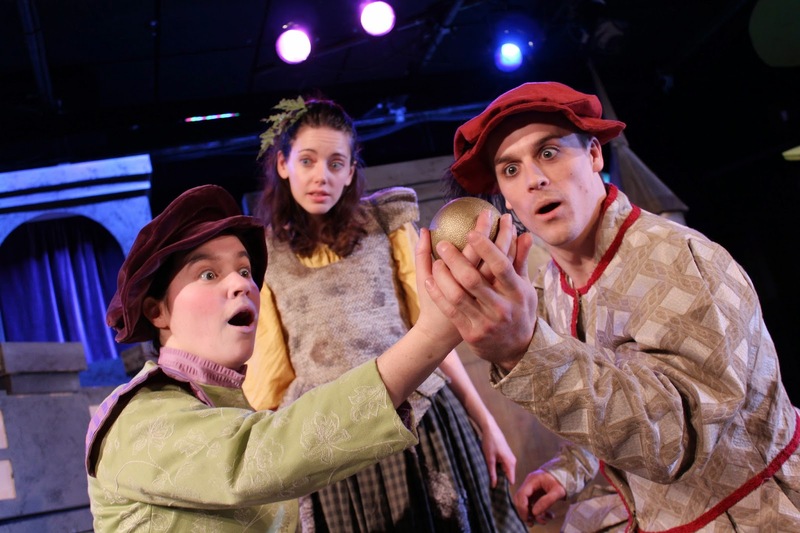 And if you are a committed Boston theatergoer (and even if you aren't) the annual Beast panto should definitely have a place on your must-see list.